I don’t have a lot of physical assets to be proud of. No flowing blonde hair, no piercing eyes, no model-worthy legs. And since I’ve had kids, whatever I had has gone south. Literally, in some cases. But I always had my eyesight. Yeah, good eyesight can’t get you a Hollywood deal or turn many heads, but it can help you avoid getting creamed by a semi and aid in spotting a small spider from a football field away. That’s right. I don’t mean to brag, but I was that good. My whole childhood, I was the only one in our family of five who didn’t need glasses. And of course, I didn’t appreciate what I had while I had it. I always longed for glasses. I thought they’d make me look smarter. Well, not so much, I found out in my 20s, when my move to Kansas City, a place I’d never lived, revealed my own myopia. As a young reporter, I had trouble in the pre-GPS years reading street signs until I was practically on top of them. In a new place, you can’t go by old landmarks. And you can’t rely on old eyes, apparently. Still, my eyes weren’t as bad as some. I rarely wore my glasses except to drive. Never needed them to use my computer, or cook, or read. As I moved through my 30s, in fact, my eyesight actually improved. It was awesome! While everyone around me succumbed to presbyopia, I was all single-vision Tina Fey glasses. I hit 40, and I still could see like a 30 year old. Smug a little? You betcha. And then my classes started this fall, and something changed. I needed my regular glasses to see the PowerPoint presentations my professors gave every week, but I couldn’t leave them on to look at my notebook. If I needed to see my watch, I had to take off my regular glasses. Sometimes I couldn’t even see what was on my fork if it was too close to my face. That is so the wrong thing to tell a woman. Age is just a number, right? Well, tell that to my eyes. But, in their defense, my distance vision hasn’t changed for years. I balked at the graduated lenses – part vanity, part economy. And then tonight, while I waited for a prescription to be filled at the drugstore, I strolled around and happened onto an end cap with reading glasses. I looked at them. A 10 spot could get you two pairs. I picked up a pair of tortoiseshell 1.25+ glasses and tried them on. Then I picked up a bottle of Triaminic from a nearby shelf. Wow. I can’t describe the feeling. It was like taking off a pair of permanently smudged glasses and replacing them with perfect lenses. I took off the readers and slipped my regular glasses back on. Blurriness. Then off with those and on with the readers. Ahhh. Clarity. 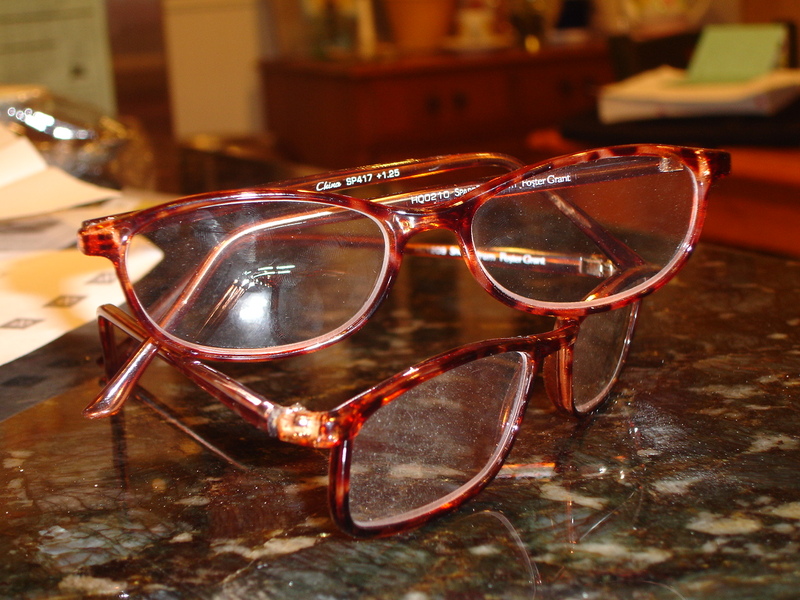 I walked down the aisle, testing the readers against my regular glasses. I just wanted to read everything I could get my hands on. The world was crystal clear! At least from about 12 inches away. Sold. I took the deal and now own two pairs. OK. On to the SAS shoes. I reached that point three years ago. I had even stopped reading books and the paper. It happened gradually. When I got my new script bifocals I was happy happy happy. i could see both the road AND the speedometer plus even text messages. heaven. Yeah, the text messages are bugging me, too. But I just don’t have time or money to get prescription ones right now, although I do have a prescription the doc gave me. He said, “You’ll know when the time is right.” Nice. Good eyesight is definitely something to be glad of. God bless readers! I know can’t even cook without them.